The residents of a once-active and thriving fishing village now burned out are among 100,000 Muslims displaced in the Arakan state and too afraid or unable to return home. 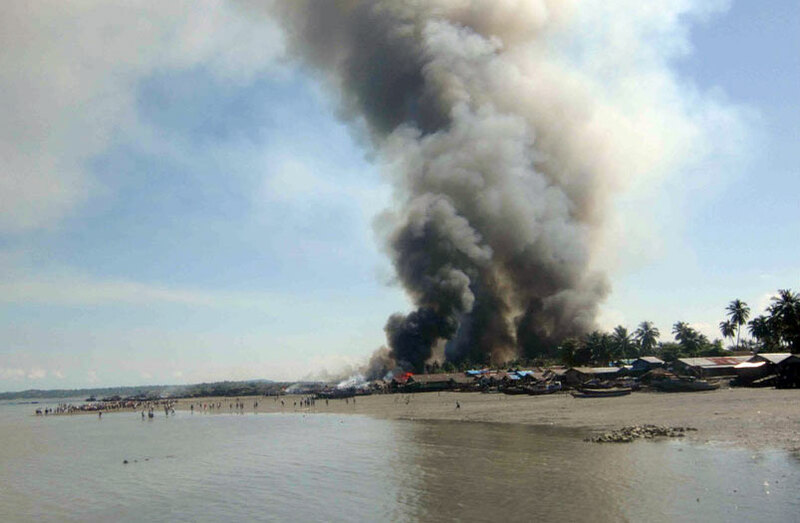 The entire Muslim neighbourhood of Kyaukpyu, a coastal town on Ramree Island, burned. Little is left of the village. A month after the neighbourhood burned to the ground, residents have still not been allowed to return to see what is left. Today, scavengers from a nearby village go through the rubble of town. One of those villagers told a reporter that the Muslims did this themselves, a view held widely among Buddhists. They set fire to their own houses and mosques to burn down other Arakan houses, she said. Others says the Muslims accidentally burned down their own properties while trying to attack neighbouring residents. Still others claim the Muslims burned down their houses to gain international sympathy in the hope of getting the attention of aid groups. That is the view held by Win Myaing, the spokesman for the Arakan state. Other houses were also burned when they set fire to their own houses, he said, then they “ran away to refugee camps”. He said he saw evidence that residents still had their cooking utensils and other belongings the day after the fire. But some Muslims in camps in Arakan’s main city of Sittwe said they were attacked by Arakan Buddhists with the help of soldiers, forcing the Muslims to flee. A 16-year-old former resident of the burned out town who lost everything in the fire told reporters that soldiers were “in the front line” of the attackers. She said Arakan villagers followed them. Muslims who moved forward when told by soldiers not to move were shot, she said. Muslims from other Kyaukpyu neighbourhoods do not agree with the negative assessment of the military by the 16-year-old refugee. Some of them say the soldiers saved them from Arakan mobs. While the mob surrounded one group of villagers, a woman said, soldiers protected the villagers from harm and eventually took them to a refugee camp. Myanmar authorities are still trying to piece together exactly what happened in the Muslim neighbourhood of the small fishing village since accounts vary widely, but whatever happened, the neighbourhood is a near-total loss. For now, Muslim residents who made it to the temporary camps in the city are being protected by soldiers. Even those with homes to which they can return stay in the camp for their own safety in many cases, reports indicate. Authorities are uncertain about when the displaced Muslim residents will be able to return to their homes or burned-out home sites. « Is Ethnic Cleansing Happening In Burma’s Arakan State?